Fifty years ago, the world was a very different place. The United States and its allies were locked in a Cold War with the Soviet Union, personal computers and mobile phones were the stuff of science fiction, and much of the world’s population had yet to experience substantial improvements in life expectancy and material well-being. Numerous countries found themselves at important crossroads – whether it was military conflict between Israel and its Arab neighbors, civil rights and war protests in the U.S., or Soviet tanks crushing Czechoslovakia’s Prague Spring. How far do people around the globe think they and others like them have come, compared with 50 years ago? Pew Research Center put that question to nearly 43,000 people in 38 countries around the globe this past spring. At a country level, some of the most positive assessments of progress over the past 50 years are found in Vietnam (88% say life is better today), India (69%) and South Korea (68%) – all societies that have seen dramatic economic transformations since the late 1960s, not to mention the end of armed conflict in the case of Vietnam. A majority in Turkey (65% better) also share a sense of progress over the past five decades. In some of the more developed countries, publics also report that life is better today, including 65% in Japan and Germany, and 64% in the Netherlands and Sweden. But not everyone is convinced that life today is an improvement over the past. Americans are split on this issue: 41% say life is worse while 37% say better. Meanwhile, half or more in countries ranging from Italy (50%) and Greece (53%) to Nigeria (54%) and Kenya (53%) to Venezuela (72%) and Mexico (68%) say life is worse today. 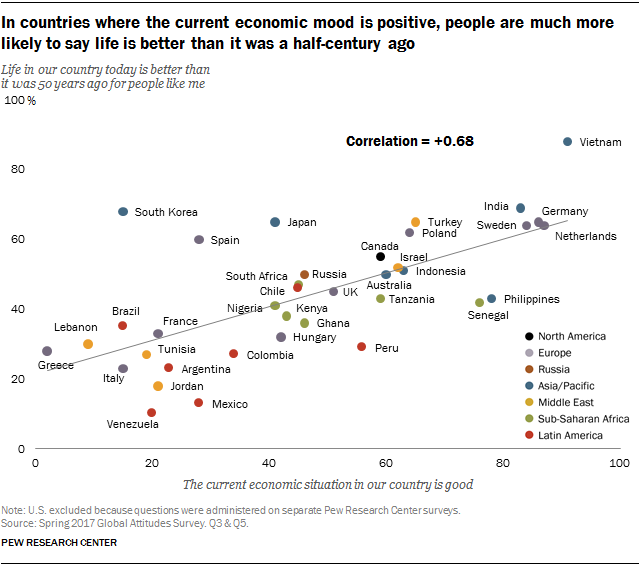 In general, countries that are more upbeat about their national economy are more likely to say life today is better compared with the past. For example, in Vietnam, where 91% say economic conditions are good, a corresponding 88% say life is better for people like them compared with 50 years ago. And in Venezuela, where only 20% say conditions are good, 10% say life is better for people like them. Overall, the correlation between economic assessments and views of the past is quite strong (+0.68). These are among the major findings of a Pew Research Center survey conducted among 40,448 respondents in 37 countries from Feb. 16 to May 8, 2017. A separate survey in the U.S. was conducted June 27-July 9, 2017, among 2,505 respondents. Latin Americans stand out for their widespread negative assessment of progress over the past half-century. Venezuelans and Mexicans (72% and 68% life is worse) are the most downbeat, but nowhere in the region do more than half say life has improved for people like themselves. Across the Middle East and North Africa, views of life today compared with 50 years ago vary substantially by country. Turkey reports the most progress in the region, with 65% saying life is better, followed by Israel, where 52% say the same about their country. Tunisians, Jordanians and Lebanese tend to say life has gotten worse for people like them, with Tunisians expressing the most widespread negativity (60%). In sub-Saharan Africa, comparative assessments of present and past are more evenly divided. A median of 46% say life today is worse than five decades ago, compared with 42% who think life is better. Positive ratings of progress range from 47% “better” in South Africa to 36% in Ghana. Nigeria and Kenya are the only countries surveyed in the region where more than half say life is worse (54% and 53%, respectively). Europeans tend to see the past half-century as a period of progress. A regional median of 53% describes life as better today, compared with 30% who take the opposite view. Upbeat assessments are most common in Germany (65% better), the Netherlands (64%), Sweden (64%), Poland (62%) and Spain (60%). 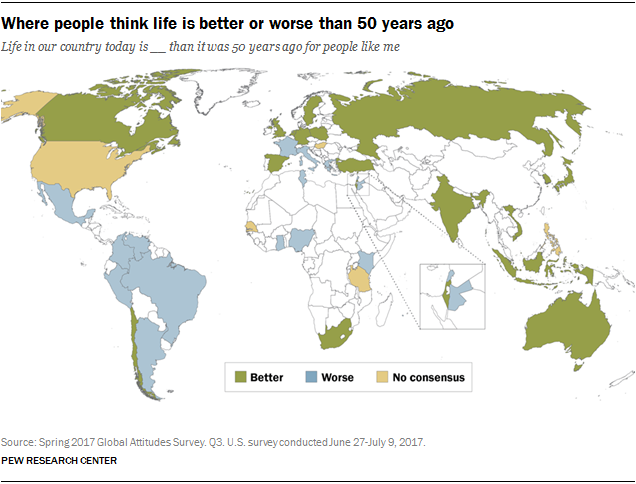 Greeks (53% worse) and Italians (50%) are the least convinced that life is better than 50 years ago. The Asia-Pacific region is home to some of the most favorable assessments of progress. Vietnam (88% better) stands out, but views of life today vs. the past are also quite rosy in India (69%), South Korea (68%) and Japan (65%). Filipinos are the least sanguine about progress, with fewer than half (43%) saying life is better. In North America, Canadians widely report progress over the past five decades (55%) while fewer Americans (37%) say the same about life in their country. In the U.S., Republicans are more likely to say life is better today, compared with Democrats – an attitudinal shift in the wake of Donald Trump’s election as president in November 2016. The reverse pattern, with less educated more optimistic about life today, is seen in just two countries: Nigeria (by 23 points) and Turkey (9 points). While age is not as large a dividing line on whether life is better today, there are some interesting patterns by age across a select group of countries. For example, in the United Kingdom, 66% of those ages 18 to 29 say life is better today, compared with 41% who say this among Brits 50 and older (some of whom might remember what life was actually like back then). Age differences also appear in Australia, Sweden, the U.S. and Germany among advanced economies, and in South Africa, Ghana and Peru among emerging economies. There is a reverse pattern on age in South Korea, where 73% among those 50 and older say life is better now compared with 59% who say this among 18- to 29-year-olds. This pattern is also found in Senegal and Venezuela. In some countries polled, views about who has gained and lost over the past half-century divide sharply along religious or ethnic lines. In Turkey, 79% of Muslims who observe the five daily prayers (salah) that are required under Islam say life is better for people like them compared with 50 years ago. In contrast, only about half (49%) of Turkish Muslims who pray seldom or never at all see the same progress. These divergent views may in part reflect differences in opinion about President Recep Erdogan and his religiously conservative AKP party. In Nigeria – home to both Muslims and Christians, but now governed by an elected Muslim leader – Muslims are much more enthusiastic about their country’s progress. Nearly three times as many Nigerian Muslims as Christians (62% vs. 22%) say life is better today compared with 50 years ago. In Israel, 50 years after the Jewish State was victorious in the Six-Day War against a coalition of Arab nations, Israeli Jews are far more convinced than Israeli Arabs that life today is better for people like them. Nearly six-in-ten Jews in Israel say life has improved, compared with only a third of Israeli Arabs who see similar progress. And in South Africa, there is a sharp racial divide on social progress: Blacks in the country, who a half-century ago were oppressed via the apartheid system, are much more likely to say life is better today for people like them (52%), compared with mixed-race (or “coloured”) and white South Africans (37% and 27%, respectively). Populism is often associated with nostalgia for an idealized past. In the case of Europe, at least, our survey findings confirm that populists tend to be more enamored of the past than people who look askance at some of the continent’s right-wing populist parties. For example, Germans who support the Alternative for Germany party (AfD) are 28 percentage points more likely to say that life is worse off for people like them than those who have an unfavorable view of the anti-immigrant party. This pattern also holds in Sweden among supporters of the Swedish Democrats, in France among those with a favorable view of National Front, in the Netherlands among PVV supporters and in the UK among fans of the UK Independence Party (UKIP).